The Venefit procedure has been shown in a prospective, international multi-center study to be 93% effective at 5 years. Since 1998 more than 1 million of these procedures have been performed worldwide. Patients who undergo Venefit have less pain, resume normal activities faster and return to work more than a week earlier compared to vein-stripping patients. 98% of patients who have had these procedures are willing to recommend them to a friend or family member. 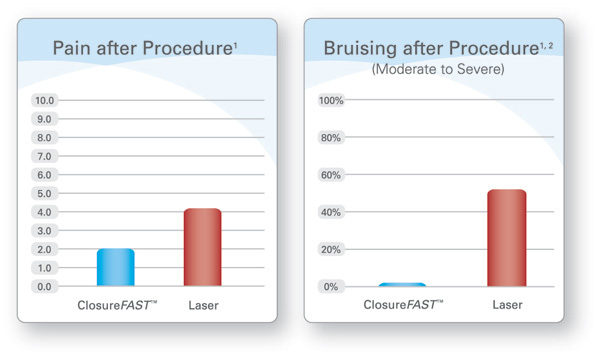 The diagrams taken from the RECOVERY trial show that the Venefit procedure (VNUS Closure) has been clinically demonstrated to produce better patient outcomes with less pain, tenderness and bruising than laser. We have performed more than 1000 Venefit Procedures to date experiencing similar results with outcomes and patient recovery.